Video & TV in Car. Front + Rear View Camera Interface BMW E-Series CIC 5 E60 61 3 E90 91 92 93 X5. TOP FEATURES AT A GLANCE. Automatic reversing camera switching When reverse gear is engaged. Automatic switching to front camera When parking. Perfect integration into the vehicle infotainment. Plug & Play interface for front & rear view camera. Front & rear view camera -Interface for BMW E-Series with CIC. This video interface Allows playback of a front and rear camera Directly in the factory navigation system. It is switched off all operating modes automatically to the existing plant and retrofit cameras gemäß to need. Upon completion of maneuvering the interface automatically switches back to its previous operating state. Private on-screen display and setup. 2 switching outputs + 12V max. 1A, separately adjustable switching. Manual switching to rear-view camera. Manual return from rear and front camera (cancellation of automatic switching) possible. Picture-in-picture (PIP) modes for combining aftermarket camera image (s) and factory park distance sensor display. Compatible with all factory video accessories (eg rear view camera, TV tuner). USB port for software updates. Automatic switching to front & rear view camera for more safety and comfort. This video interface you have a significant improvement in safety When reversing (eg recognition of children playing), a Substantially simplified orientation When maneuvering or parking – all without installing any additional interfering optically monitors. When reverse gear is engaged, the interface will automatically switch to the rear camera. Alternatively, you can manually switch to the rear view. When parking-operation, the interface will automatically switch to the front camera. Once 20 km / h are reached, the downshift is Carried out in its previous operating state. Only video feed, no sound feed. Compatible with factory rear-view camera. Working voltage: 10.5V – 14.8V. Quiescent current: <0.1mA. Power Consumption: 2.6W. Temperature range: -20 ° C to + 85 ° C. Dimensions: 141 x 30 x 105 mm (W x H x D). Automatic detection (PAL, NTSC). Car specific connection cable set. 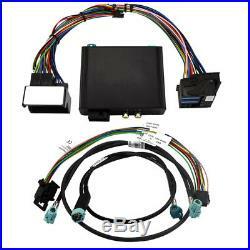 BMW E-series and Mini navigation system or radio with 6.5 "or 8.8" on-board monitor with 4pin HSD LVDS connector. Installed eg in the Following BMW vehicles. 1 E81 / 82/87/88. 3 E90 / E91 / E92 / E93. 5 E60 / E61. 6 E63 / E64. 09 / 2010up with 2-button iDrive. Some of our customers reviews. The item "Front + Rear View Camera Interface BMW E-Series CIC 5 E60 61 3 E90 91 92 93 X5" is in sale since Wednesday, February 22, 2017. This item is in the category "eBay Motors\Parts & Accessories\Car Electronics\Car Video\Video Monitors Only\Rear View Monitors". The seller is "www_maxxcount_de" and is located in Dresden. This item can be shipped to North, South, or Latin America, all countries in continental Asia, Australia. This multimedia interface allows you to connect a front and rearview camera to your factory navigation system or OEM LCD screen. Whether or not your vehicle is equiped with factory navigation or TV tuner, as long as your vechicle is fitted with a factory LCD screen, our interface module will open up a new world of in car entertainment in you vehicle. Rear-view camera input with dynamic guidlines. RGB input for external navigation. Automatic switching to rear-view camera input on engagement of reverse gear from all operation modes. Picture-in-picture mode combining after-market rear-view and front camera picture(s) with factory parking sensor graphics. BMW Business 6.5 with 4pin HSD. BMW Professional 10.2 CIC with 4pin HSD connector. BMW 1 Series (E81/E82/E87/E88). BMW 1 Series (F20). BMW 3 Series (E90/E91/E92/E93). BMW 3 Series (F30/31). BMW 5 Series (E60/E61). BMW 5 Series (F07/F10/F11). BMW 6 Series (E63/E64). BMW 6 Series (F12/13). BMW 7 Series (F01/F02). Front and rear camera is not included in this listing, please check the specific cameras for BMW in our store. Installation Connect the interface wiring to the existing HSD connector located behind the screen. Instructions on where to connect the wires are included. We have extensively tested this product over the past years and confident that it will work with all factory fitted systems in the car models listed above. We aim to provide a pleasant shopping experience for all of our customers. We are a highly specialized company that sells Car Audio, Multimedia, GPS and Bluetooth devices for German cars. Alpine – Pioneer – Kenwood – Dension – ACV – Viseeo – Fiscon – Ampire – Caraudio-Systems. El 18-mar-15 a las 06:31:17 H. Esp, el vendedor añadió los siguientes datos. Add a map to your own listings. The item “BMW CIC FRONT REVERSE CAMERA INTERFACE 1 3 5 6 7 X1 X3 X5 X6 Z4 F10 F11 F01 F25″ is in sale since Monday, November 28, 2016. This item is in the category “Motor\ recambios y accesorios\Coche\ Hi-Fi, GPS y tecnología\Cámaras de marcha atrás”. The seller is “worldwide-sounds” and is located in Braga, default. This item can be shipped worldwide.